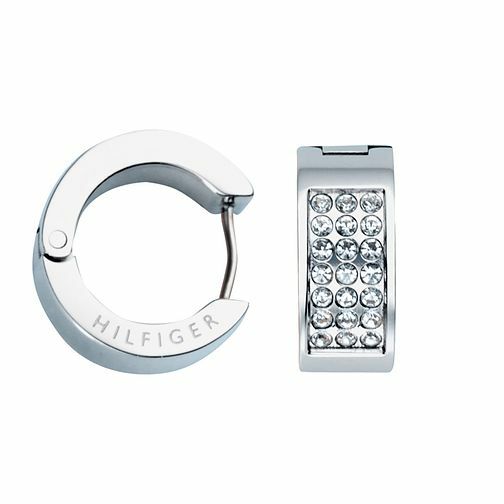 A sparkling twist on the traditional, these ladies' stainless steel huggie earrings from Tommy Hilfiger are set with dazzling Swarovski Crystals and etched with "Hilfiger". Tommy Hilfiger Ladies' Swarovski Pave Huggie Earrings is rated 4.0 out of 5 by 1. Rated 4 out of 5 by Anonymous from Pretty earrings Bought these online they are very pretty exactly was I was looking for not too big not too small. However I had to go to the local shop to replace them as one of them was slightly loose ( hoop earrings are usually made with two attached halfs and one was nicely tight and another very wiggly ) when I arrived to the shop the replacement pair had same problem so we had arranged with shop assistant to make it work by keeping two loose ones together and another two tight ones I kept to myself so I was happy in the end. Shame that Tommy doesn’t do proper quality control as it would save me a journey.